St. Louis’s third annual Caffeine Crawl kicked off in the late Friday afternoon sunshine at the roasting plant of our roaster sponsor, Chauvin Coffee. Crawlers grabbed Wholesome Sweeteners goodie bags filled with their very own copy of Barista Magazine and treats from our other awesome supporters – Wholesome Sweeteners, Bhakti Chai, and Rip Van Wafels. We sipped coffee from Chauvin’s in-plant café and learned about their roasting processes. 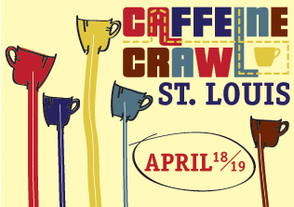 After listening to Verner and the Chauvin team give a history of their more than 80 years of coffee roasting experience, Crawlers piled into buses from St. Louis Transportation and we were off. At Sump Coffee, Scott invited crawlers to observe coffee brewing in action as he served up a delicious Rwanda from the sleek Alpha Dominche steampunk machine. Comet Coffee went all out with a game of The Price is Right to compare coffee pricing and quality correlations. Crawlers got a big surprise when the least tasty brew was revealed as the most expensive – our very own taste of the renowned Kopi Luwak, for $125 per pound. Kakao Chocolate had paired up with local roaster Stringbean Coffee to create a mind-blowing chocolate pairing – bourbon-infused cold brew aged in oak barrels washed down with a brownie truffle, soaked in Stringbean’s “moonshine,” coated in marshmallow and chocolate. We drooled all the way to the next stop. Blueprint pulled shots of their newly released Penrose Espresso on the Barista Nation Stella di Café espresso machine built by Unic. Crawlers admired their sleek, minimalistic bar set up, and USBC finalist Nora Brady demonstrated a run-through of her barista competition. A lovely evening was complemented at roaster sponsor Kaldi’s Coffee’s original café in DeMun. There, a lovely “cocktail reception” complete with local chocolate, a beer collaboration with Urban Chestnut, cheese and coffee pairings awaited Crawlers. Kaldi’s roasting plant created great energy and style as the starting point for Saturday’s Crawl. The Kaldi’s team divided the nearly 100 Crawlers in 3 groups to go over roasting, coffee topics and Kaldi’s own history in specialty coffee, with a barista competition run through from David Fasman. It was great having new additions Rise Coffee House, Blueprint Coffee, Chronicle Coffee, and Coffee Cartel on the Crawl this year. The 24-hour shop Coffee Cartel made us coffee chillers with a Chauvin Coffee blend. Rise Coffee brought us to the Grove for a taste of community, and a signature espresso drink using local honeycomb. We took in a roasting demonstration at Northwest Coffee Roasting Co., with the garage doors open and the smell carrying into the streets. At Chronicle, owner Jason Wilson gave an inspiring talk on St. Louis neighborhood history and community while we had pourover brews of two different origins roasted by Northwest Coffee, which Chronicle owns and operates. Comet Coffee changed up their topic for day 2 with a washed vs. natural Ethiopian tasting. The sun was shining and temps were perfect. That was obvious by the crowd at Kayak’s Café on Skinker near Forest Park. At Kayak’s the staff delivered hospitality, lunch, and coffee 4 different ways – Toddy, Clever, Chemex, and French Press. Crawlers left with coconut chocolate cookies and a taste for brewing diversity. Another success and satisfying 3rd annual Crawl through a vibrant, caffeinated city.